I just picked up a chest freezer. 7cu-ft.
Lookin for pointers and tips related to converting this into a keezer. I am planning on a wooden collar. But also want to make sure that wood is well insulated and also protected from humidity. I plan on 4 taps being present and having the co2 tank on the shelf inside. I was also going to build a wooden frame for it so it looks nicer. Maybe raise it off of the ground? I don't have any pictures to post at the moment. 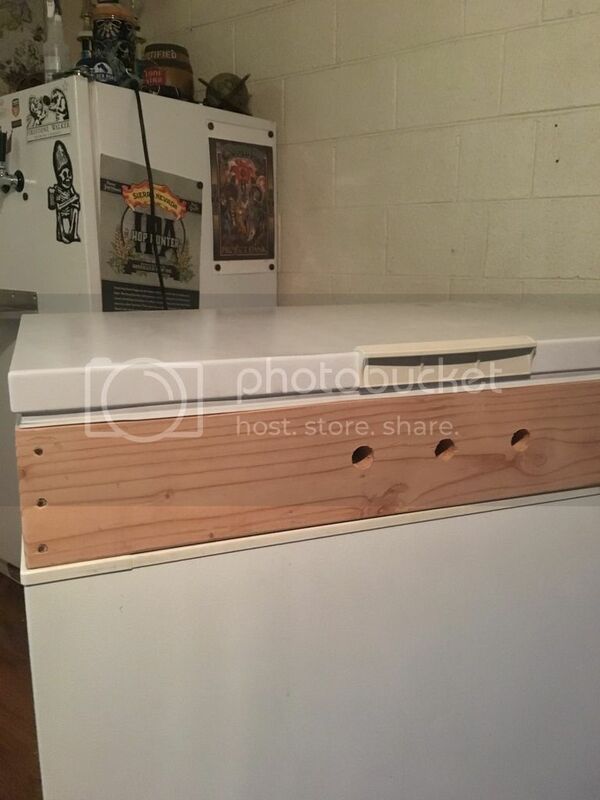 I mounted my 7" freezer on a piece of plywood about 2" longer and wider than the base. I ran a .75"x.75" edge around the top of the plywood to make it look a bit cleaner. The most important thing the platform allowed me to do was put 3.5" wheels under the unit. This means I can move it around as needed with out unloading it. Other than that, I just painted the wooden collar with Gloss-White paint, mounted the top on the collar, and hung my temp controller on it. Have fun on your design and build! My system has worked very well is basically maintainance free (sans cleaning, of course). If the internal height will accommodate corny kegs, your next concern is whether the top is rigid enough to support a tower. If either answer is negative, you need to build a collar. What you do beyond that is up to your judgement. Be aware that cooling is accomplished by transferring heat from the interior to the exterior, so anything between the exterior walls and ambient will significantly lower the cooling efficiency. The good news is that you need much less efficiency to maintain `40 degrees F.
I painted my collar (gloss white too) and then lined the inside of the collar with the mylar bubble type insulation, sealed to the top edge surface of the collar and to the freezer at the bottom with foil tape. Used weatherstripping to make a good seal when the lid was reattached (it was designed to fit into a recess.) The insulation may have been superfluous, but it made me happy. Humidity tip: Damp Rid. Sits on the shelf real nice next to your CO2 bottle. EDIT Another thought, about raising it off the ground. You're already adding at least 6" with the collar. Don't know how tall you are (I'm not very) but remember you have to lift kegs in and out. I am 6’1”. I like the wheel idea. That plus a collar would make serving height around mid stomach maybe higher. The shanks on my taps are 4.5” if I remember correctly. They go through a fridge door with a piece of wood now. I do want to make like a wooden box for aesthetics around the freezer. But probably also give some breathing room around the hot spots. I have seen a keezer with a dehumidifier on the inside, is that just a waste of electricity if I surrounded the collar with some kind of insulation? What do you guys think? And or, how often do you replace the damp rid? Couldn't say, I just periodically check to see if the bottom tub needs emptying of liquid or the basket of chloride needs topping up. Depending on weather and frequency of opening/closing the keezer, it can take months to need attention. I keep Damp Rid in my keezer, ferm chamber, lagering freezer, and even a tote I keep small gear in in case a piece of tubing etc gets put away a bit wet. Cheap dehumidifier, why go more elaborate until you see if it's sufficient? I would suggest buying premium quality products right off the bat, as I went cheap at first and am now regretting it and wishing I had some nice perlick taps. Also, last month there was a great article on how to get the perfect pour Everytime that has to deal with tap lines and how much tubing you need in Zymurgy. I recommend looking that up. I have a tower coming right out the top of mine. Someday I'm going to enclose mine with cupboards on either side for additional storage. Wheels are a must! You have to get it away from the wall in order to open it to get your kegs in and out. (The downside of having towers out the top). I have three less than a year old ss intertaps on my current system, I even have the stout spout which is fun to is play with. My shanks are ss too. Pretty much galvanizing the old system for a new. Not sure what to do with the soon to be old fridge, since I’ve drilled 4 holes in. Intertaps rock, I dont know why any others exist. If you have the flow control ones, you don't even have to worry about balance that much. If your taps are through the collar, you not only eliminate having to move it away from the wall to open. You also don't have to have a fan to cool the tower, and possibly more elaborate dehumidifier to deal with larger, inaccessible area. As for the old fridge: If you have any use for a spare fridge, just fill the holes with expanding foam, shave it flush and seal up with tape. Otherwise, yeah, not an easy sale. I’m not fancy enough for flow control. 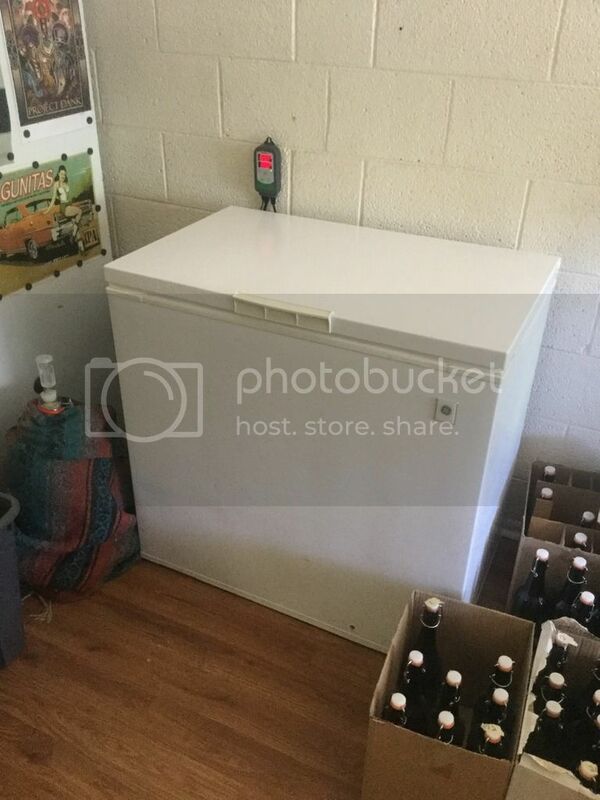 I’m thinking about turning the old fridge into a lagering fridge or for cold side temp controlling (it has a controller on it that came with it). You can kinda see the height of that fridge in the picture I posted. It’s just kind of a waste of space because it’s tall and kegs and carboys aren’t. Maybe throw a shelf in there so two things can be cool at a time. Anyone have experience drilling small holes in one of these to mount a manifold on the inside? I don’t want to ruin the unit by punching through a line. I don’t plan on using long screws. I wouldn't drill into anything but the collar. Just built the collar today. I mounted mine to one of the plastic baskets that came with the freezer.